Taking up fishing as a hobby can become expensive. If you are unsure of what you really require, you could end up spending loads of unnecessary cash on items that you may never use. If you are simply trying your hand at something new, and not sure whether or not you will be continuing with the hobby, so buy only the bare necessities. For first time fishermen, there is really not much that you need to have in your arsenal. A Spincast Rod and Reel Combo is more than adequate for your exploratory trip. Remember to pack your bait, and of course, your fishing license. The importance lies in matching your equipment properly and knowing what line size is required. The equipment you choose will determine how quickly and easily you are able to cast. Your first fishing expedition will more than likely see you plodding the aisles at the local bait and tackle shop which will probably leave you more bewildered than before. Select a beginner rod and reel with a 10lb test line for ease of use. 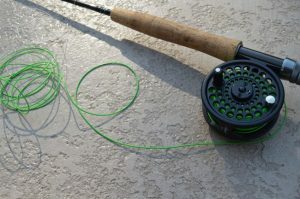 Many of the reels come already spooled which will cut down your costs a little to start off with. The next thing to mark off the list would be hooks. Settle for basic eagle claw hooks, or if you prefer a bit of variety go for a spindle. Red and white bobbers that look like little balls are another small expense. Gaining more skill and experience will leave you wanting for better equipment. The need to change your equipment according to your new found knowledge is an inevitability. As you set your sites on bigger targets you will begin to explore a variety of gadgets on the market. Bear in mind that all you really need to fish is the basic tackle; rod, line, sinker, bobber, hook and bait.